The Julenisse greets visitors during Juletrefest at Vesterheim Norgwegian American Museum Saturday, during the museum's celebration of a Norwegian Christmas." Photo by Charlie Langton. For more photos, see Thursday's Decorah Journal. 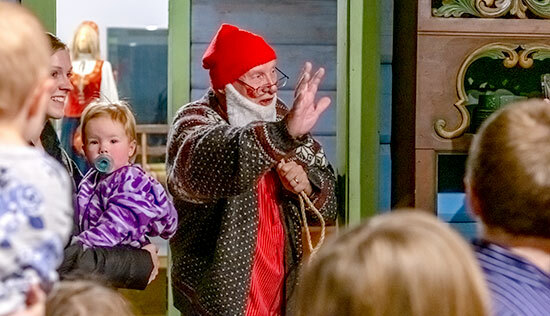 The lively day of events featured fun holiday traditions, concerts by local groups, take-home crafts, folk-art demonstrations and sales, an outside campfire with Scandinavian s’mores and a pop-up café serving Norwegian holiday specialties. The event was sponsored by Duane and Eileen Bruening with additional support from Sons of Norway Valdres Lodge No. 1-503.